EdTech leaders join forces to increase assessment integrity for educational institutions across the globe. DALLAS, Texas – March 18, 2019 – ExamSoft, a secure testing and assessment platform company based in Dallas, Texas, that provides robust data and analytics to help faculty with accreditation, remediation and increase student outcomes is announcing a strategic partnership with the industry leading digital online proctoring company, ProctorU, to create a comprehensive remote integrity solution. Educators depend on ExamSoft for the peace of mind that comes with our heightened exam security. 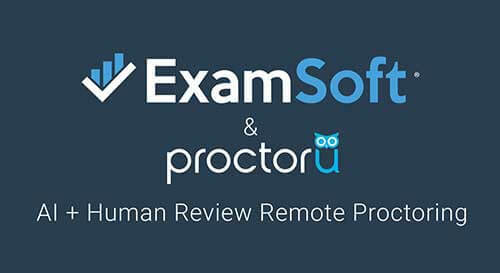 Now, with ExamMonitor and the power of ProctorU, services for monitoring the exam takers’ actions during the assessment process, educators have the ability to test anywhere, anytime, without compromising the integrity of the assessment,” says Britt Nichols, chief revenue officer of ExamSoft. ProctorU provides a full suite of online proctoring and identity management solutions for education, professional development and credentialing organizations. With patented, 24/7 on-demand live proctoring and a fully-automated platform, both backed by artificial intelligence, ProctorU offers a powerful, convenient and cost-effective alternative to traditional test centers. ProctorU increases access to online learning while ensuring exam integrity and accountability for any test-taker with internet access using only a computer and a webcam. To learn more, visit ProctorU.com.